Every time Baby Manaswin has to be taken to a hospital his mother tells him they are going for a trip to his grandmother’s place. He gets overjoyed but soon his joy turns into painful tears when they reach the Hospital. For a 3-year-old baby, visiting a hospital itself is a traumatizing experience and this little baby has gone through several tests, treatments, and even two hernia surgeries. Mansawin’s parents had to go through a lot of trouble in life. 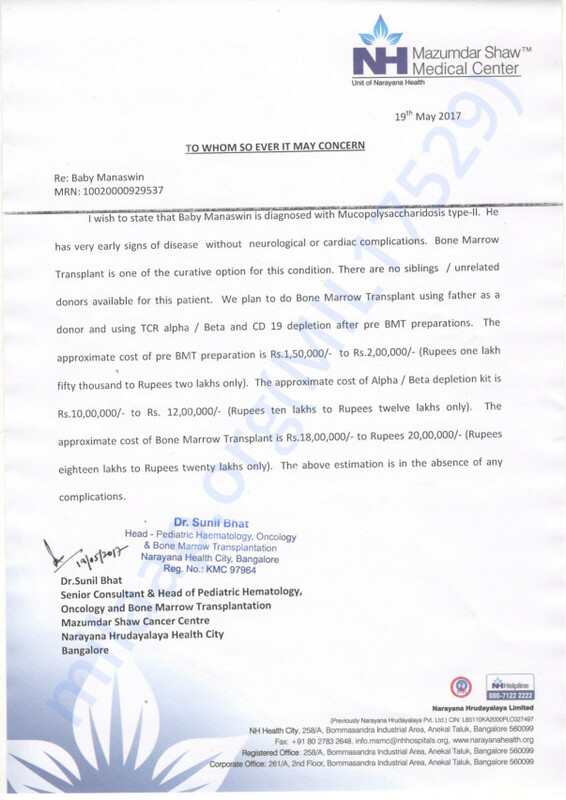 Mansawin’s mother had to undergo a knee surgery for which they had spent around 2 lakhs. She was recovering from her surgery when tragedy came knocking on the door. Manaswin’s father is the only earning member of the family, His grandfather is not keeping well, his mother has also not recovered fully. Life was difficult for the family but Manaswin was the bundle of joy who was keeping them going. But their peace of mind disappeared since July 2016 when Manaswin was down with fever. Initially, he was taken to a local hospital where he was given some medicines but his fever was persistent. They visited different hospitals doing an endless number of blood tests. This went on for months until December 2016 when they ultimately got to know that little Manaswin is actually fighting Cancer. The only way to save Manaswin from this unimaginable suffering is a Bone Marrow Transplant. His father is an HLA match. But the current financial condition of the family is very bad. They have already spent around 2 lakhs just for the tests. 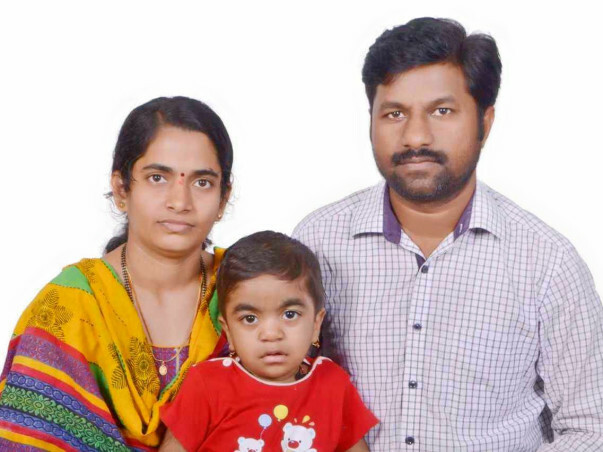 His surgery needs around 30 Lakhs which is not possible for Manaswin’s father to afford. You can help this little kid come out of his misery. I'm rejoiced by the love and support blessed on my Son. After the BMT, Manaswin has enzymes lacking in his body so there are few tests conducted upon the same. First Enzyme test was done in September, second one will be done in February. Every month regular check up will be done to observe the condition of the baby. He is undergoing physiotherapy sessions at home everyday, because of which he has been able to walk properly and gain strength. He has improved a lot mentally and physically. Doctors have planned to start the vaccination from February. Thank you all! Please pray for my Son's health and share the campaign. It gives us immense pleasure in informing you all that Manaswin successfully underwent a bone marrow transplant on the 19th of December, 2017. The baby is doing well now and the doctors are observing Manaswin closely for any irregularities. We are all hopeful about the baby's recovery. Please keep praying. Here is an update on Manaswin's health. He is doing better now compared to before. He has undergone chemotherapy and his response was good to the treatment. A few tests are being conducted and then based on their reports the future course of action will be decided. Based on his response to the treatment so far, the next step in his treatment will be the bone marrow transplant. Thank you for all the support you have shown Manaswin so far. Please do pray for his health and speedy recovery. My prayers to God to give the child the needed strength and help recover from all his ailments.